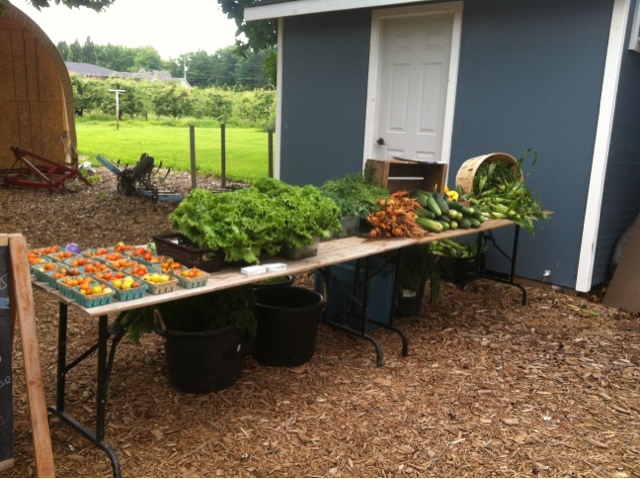 It's week nine of our summer CSA program here on the farm. Wow how time is flying we only have seven weeks left before we wrap up. Of course wrapping up is all relative a we will be heading into a busier season with winter CSA. Our customers are literally about to show up for this weeks great veggie selection. What comes at the end of July? Well this week the basket include: kale, lettuce, tomatoes, carrots, cucumbers, summer squash and corn. A pretty tasted line up if I do say so. Check out the picture below to see how our CSA table looks. So glad that I am a part of this!